The Central Intelligence Agency’s ability to claim that it can “neither confirm nor deny the existence or nonexistence” of “the use of unmanned aerial vehicles” derives to another vehicle. A boat. An extremely large boat. 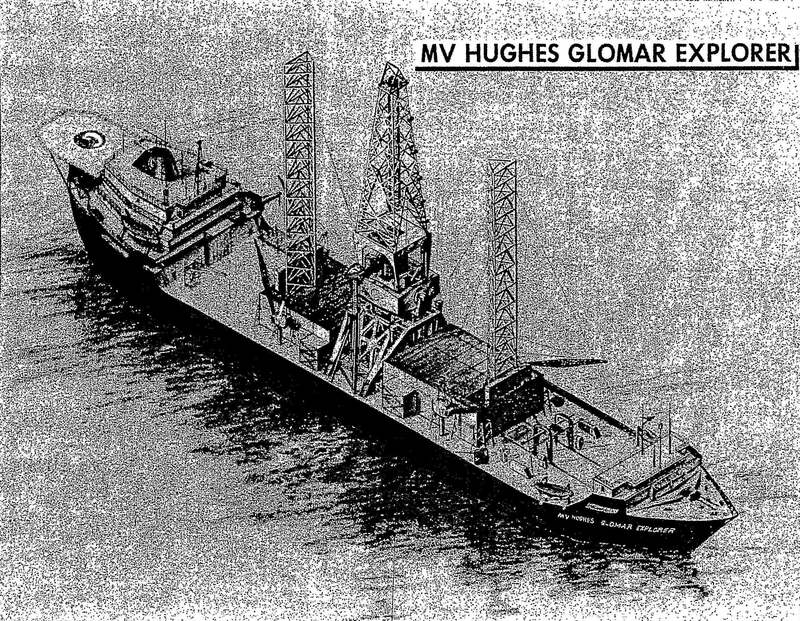 The Glomar Explorer, as WNYC’s Radiolab explains, was built by the CIA with help from Howard Hughes for the six year (1968-1974) Project Azorian. 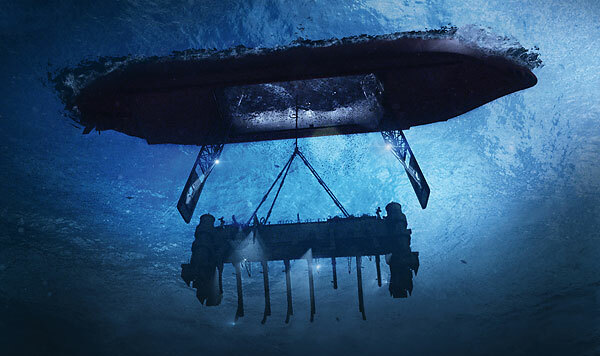 Project Azorian was a secret, ambitious endeavor to salvage and examine a Soviet Golf-II class submarine –and its three one-megaton nuclear missiles– which had sunk to the bottom of the ocean floor 1,560 miles northwest of Hawaii. As Project Azorian developed, Seymour Hersh sniffed a story, but the CIA successfully convinced The New York Times to suppress publication. A year later a journalist, Ann Phillippi, filed a Freedom of Information Act request for documents about the Glomar Explorer and the CIA’s attempts to censor press coverage. The CIA, questionably citing FOIA law, claimed it could “neither confirm nor deny” that documents about either the ship or the censorship existed; a judge agreed. The term “Glomar response” stuck. And so did the the ability for the CIA (and the entire US government) to refuse to confirm or deny the existence of documents in response to FOIA requesters. So how do we know so much today about the Glomar Explorer and Project Azorian? Ironically, because of the Freedom of Information Act. In 2010, my colleagues at the National Security Archive got their hands on a series of declassified table of contents to Studies in Intelligence, the CIA’s classified in-house journal. 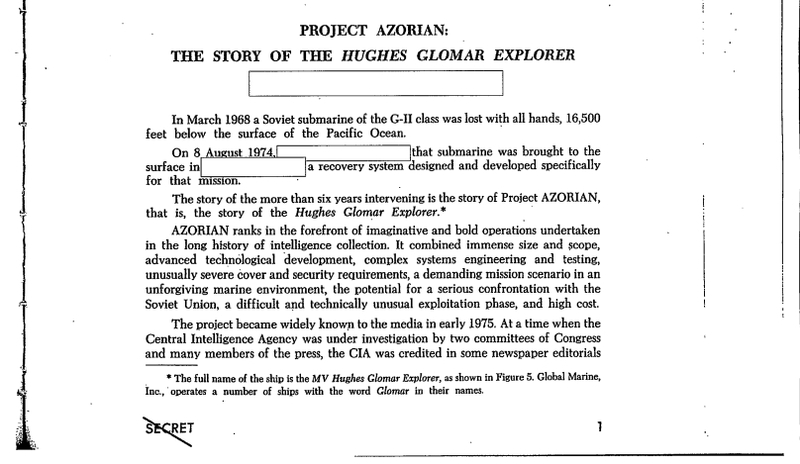 One of them, the Fall 1985 edition, included the title: “Project Azorian – The Story of the Hughes Glomar Explorer (Secret).” We filed a FOIA request, and eventually received the redacted, but still encompassing and fascinating, internal CIA history of The Glomar Explorer —highly worth a read. Around the same time, my colleague Bill Burr was also able to win the declassification of two memorandums of high-level conversations between President Ford and his national security team as they worried over leaks about the Project. After the National Security Archive posted the CIA’s history of Project Azorian, retired CIA officer David Sharp, who served on the crew of the Glomar Explorer, was finally able to publish his book on the Project, The CIA’s Greatest Covert Operation: Inside the Daring Mission to Recover a Nuclear-armed Soviet Sub. Until the declassification of the Studies in Intelligence article, the CIA’s Publication Review Board had refused to give full approval to Sharp to publish his book. Sadly, the wisdom that led the CIA to declassify its secret history of the Glomar Explorer has largely not spread to other parts of the Agency –or the rest of the federal government. The use of Glomar non-denial denials also remains rampant; just this week, two more headscratchers have occurred. First, the National Security Agency sent two FOIA response letters to Freedom of the Press Foundation reporter (and “FOIA Terrorist“) Jason Leopold. The first refused to confirm or deny the existence of project DISHFIRE, an operation which captures SMS text messages. Bafflingly, the second letter –despite the NSA’s earlier attempts to shroud the very existence of DISHFIRE in mystery– confirmed the existence of DISHFIRE so that it could deny his request for expedited processing. Of course, if an agency loses a Glomar appeal, it is not uncommon for that agency simply to admit that, yes the documents exist, but they remain properly classified. So no, you cannot see them. On the other hand, as the National Security Archive’s receipt of the CIA’s history of the Glomar Explorer has shown, “no information may remain classified indefinitely.” And besides, Glomar doesn’t work on leaks. In the 1970s, a number of books and articles claimed incorrectly that “Jennifer” was the name of the operation. Rather, “Jennifer” was the name of a small security compartment for the work being done on Azorian, thus restricting all knowledge to a very small and select group of people inside the White House and the U.S. intelligence community, including President Richard Nixon and his national security advisor, Henry Kissinger. Sharp recounts that Soviet ships routinely shadowed The Glomar Explorer. Before the departure of one Soviet ship, it approached close to the Explorer; close enough that the Americans could see their Soviet adversaries “mooning” them. This new requirement has also led to the declassification of several Presidential Daily Briefs. It is difficult to track the frequency of Glomar denials across the US government. 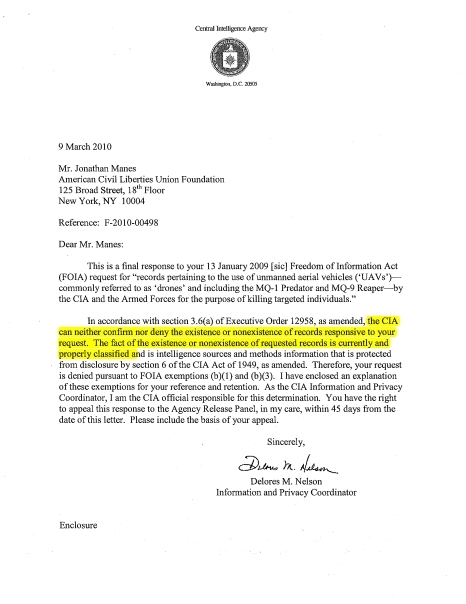 According to the Government Handbook on FOIA (h/t Gavin at CEG), “[Reported Full Denials] include Glomar responses where an agency neither confirms nor denies the existence of responsive records based on one of the FOIA exemptions.” That means, in theory, that Glomar non-denial denials make up some unknown subsection of the 30,727 requests denied in FY 2013 (see pages 4 and 5). So, who ratted out Project Azorian to the Russians as soon as the project started? It would seem to be a mole/traitor at the highest level.